If you’ve been up to the brewpub recently, you’ve probably noticed some big changes. Gone are the sports memorabilia and other nick knacks that have collected on our walls over the years. In their place, a fresh coat of paint and some beautiful photos by our own Allison Smith. We’ve grown up a lot in 8 years, and we felt it was time for our look to do the same. In the coming months we’ll also be making some changes to our food menu. We aren’t changing the way we make things or even necessarily the basic things we make, but we will be paring he menu down to be less cumbersome and more to the heart of the favorite items that have emerged. We’ll still be able to customize any pie you want to dream up, but the menu will smaller and simpler. On the beer side of things, you may have already noticed big changes. 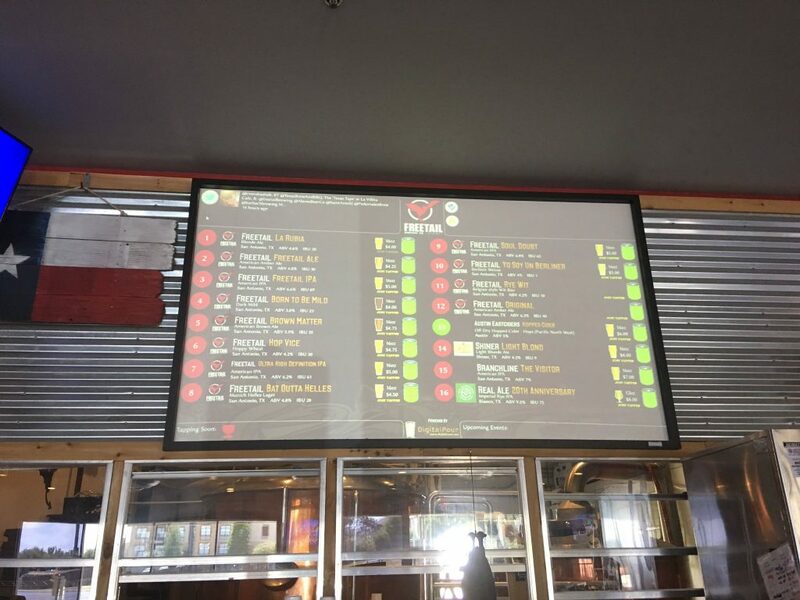 We’ve undergone a much needed upgrade of the beer board software. We were running a (lame) powerpoint presentation to display the beers as a short-term fix that lasted too long. Earlier this week we implemented Digital Pour which is a much cleaner look with better information and the social interaction features of our old board. But the point of this post is to talk about the changes to the most important part of the beer board: the beer itself. Since we opened, we had always prided ourselves in offering a wide array of beer offerings. With that said, what constitutes “a wide array” is a lot different now than it was 8 years ago. As more and more craft friendly bars and restaurants have opened, it has made us step up our game with a greater level of curation of our tap list, and that is what we’ve attempted to do with the new beer board. Keep our two S Presa flagship beers, Bat Outta Helles and Soul Doubt, on tap all the time in addition to our current seasonal (which right now is Yo Soy Un Berliner). Also, we’ll keep Rye Wit and Freetail Original available in cans for drinking on site. Of the 8 remaining taps, we will attempt to keep 3 local (and by local we mean San Antonio) beers on. We may sometimes slip below this number, but that is our goal. Because we believe in complete transparency, we have no problem telling you that right now our difficulty in choosing San Antonio-brewed beers has to do with a) quality and b) price. This is really the subject for another post, but not all beers brewed in San Antonio meet our quality standards, and we won’t carry those. Among those that DO meet our quality standards, we find many times that the pricing is significantly higher than market pricing. Because these higher prices inevitably get passed on to you, we sometimes have to make the tough decision to pass on kegs because the price is too high relative to the quality and availability of the beer in question. San Antonio brewers, if you think I’m talking about you… well, maybe I am. Check yo’self. The last two taps are reserved for non-Texas brands that a) meet the Brewers Association definition of a Craft Brewer (the only thing we carry that doesn’t meet this criteria is the cider… because it’s cider and not beer) and b) where we have some kind of personal connection to the brewery. So for example, right now we have Maui Coconut Porter, in large part because I’ve gotten to know and befriend Maui Brewing Co’s founder, Garrett. Since these taps are for non-Texans, we did want to at least make the stand that they are for our friends only. The good news is… we have lots of friends, so look for lots of great beers from around the country coming to those two taps. This has been a fun project to re-think the way we approach our beer list, especially on the guest side, and I’m excited about what we’ll see rolling through. At the same time, we’ll also be letting Zach (our 1604 Headbrewer) have even greater freedom to express his own creativity out there and we are looking forward to fun new beers. Hope to see you at the pub soon!